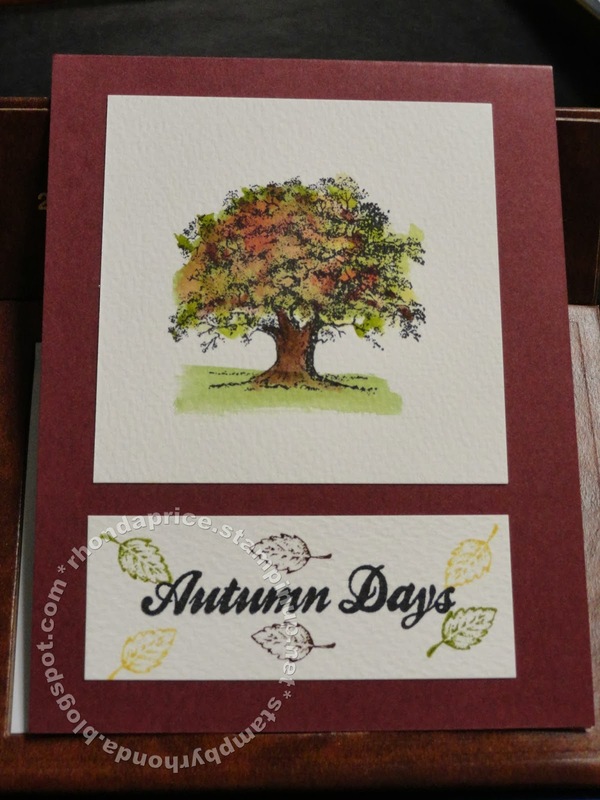 Paper Wishes and Stampin' Dreams: Fall is in the air. Lovely As A Tree has been in the Stampin' Up! catalog for many years. It has probably been the longest running stamp set they offer. The images cover all seasons. I love this set and it was one of my first purchases, but this is the first time I have used it. I belong to a Facebook group called Stampin Up Addicts. We buy, sell, and swap on the group. I love the swaps. I participated in the Halloween swap we did in August and it was so much fun. For the September swap, we did a Fall/Thanksgiving card. This time we had enough interest to do two groups. I signed up and sent my cards for the first group as soon as I could. The second group had a lot of interest, but some of the ladies dropped out or didn't send in their cards. When the call went out for more entries, I answered and created this card. I am sadly lacking in Thanksgiving/Fall sentiments and had to use a non Stampin Up! sentiment for this card. It is from Hampton Arts. This is one of my few watercolor attempts. This one turned out better than most. The colors I used are Old Olive, Pear Pizzazz, So Saffron, Real Red, and Chocolate Chip. The image was stamped on watercolor paper with Stazon Black. My card base is Bravo Burgundy. Rhonda, I love the way this tree is colored. It looks like a stamp I have never seen in the book instead of one that has been there for a long time. What a difference the coloring makes! !